Calling all Coventry City fans – Sunday August 11th: protest at The Ricoh Arena. Coventry City will officially be playing their ‘home’ games at Sixfields, the home of Northampton Town Football Cub for the next three seasons; despite widespread opposition and anger from Sky Blues supporters. As such, at least ELEVEN of City’s home games will be moved, including City’s first home game against Bristol City which will now be played on Sunday August 11th,kick off 3pm. 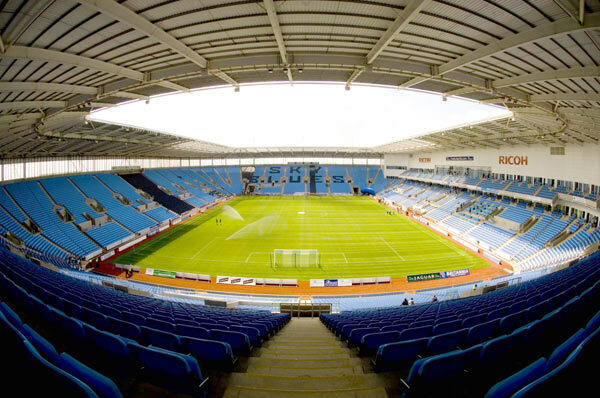 Tonight we call on The Sky Blue Army to travel to The Ricoh Arena for the duration of the match in a peaceful protest at the decision to allow Coventry City to move out of the city, rather than travelling to Sixfields. Whether it is listening to the match on a digital radio outside the ground, or watching updates on Sky Sports News inside the casino, it is time to show Sisu, Joy Seppala & Tim Fisher that the supporters will NOT be travelling on a 70 mile round trip to Northampton to watch ‘home’ games. “Many fans have long called for Sisu to go. Not the Telegraph. We have acknowledged it is their investors’ cash that has kept the club alive – no matter how badly it has been wasted in taking the club from the Championship to League One. But now it is different. Sisu’s plan to take your club 35 miles away to Northampton for at least three years while they build a new stadium near but outside Coventry is utter madness and will tear the heart out of this city. As a newspaper we cannot support an owner who is willing to do this. « Cody McDonald on the way to Gillingham for a third spell?